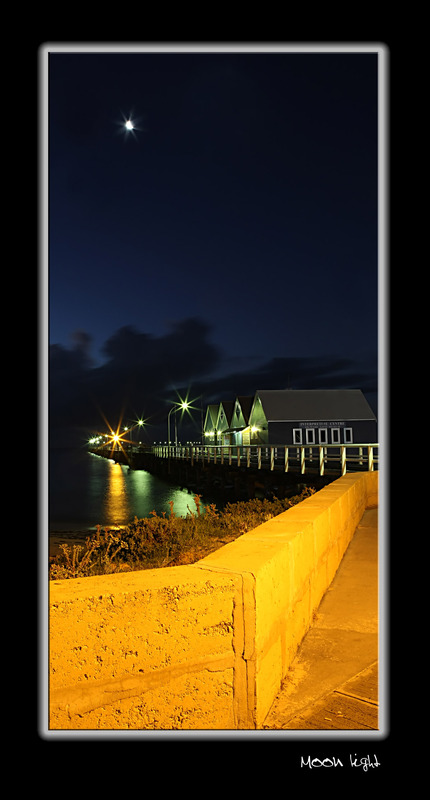 Thought I would give some night photography ago while I was down south.This is the very photographed busselton jetty by night.This was about a 40 sec exposure with nearly no photoshopping except a little noise reduction and a bit of sharpening.I thought this worked out really cool. ~ by Mel on July 11, 2008. I realy love this Mel, Great Perspective and the moon just tops it off. You just may want to photoshop out the cigarette butts on the ground. Cool shot Mel, I like the little star effect on the moon. It’s good to see a different take on a familiar subject. Hey this is bloody great. Its also original, nobody else has done this. Your photography is great as far as starting a blog nobody knows about goes (better than mine, anyway). Keep it up.